DeSantis 11D New York Undercover Shoulder Holster Rig FREE SHIPPING! The 11D New York Undercover Shoulder Holster Rig from DeSantis is a classic concealed weapon set-up perfect for detectives, tactical professionals and anyone wishing to carry sidearms with discretion. The entire rig is constructed from high-quality cowhide and tanned to perfection for maximum durability and a classic appearance that never goes out of style. Each holster is precision-shaped for firearms, providing a secure hold that will not let up. The holster system is fully adjustable and offers secure carry of both a single pistol and two spare magazines. Pivoting hardware located at each junction point and fully adjustable straps offer a custom fit that feels great all day long. The 11D offers additional accessories that are sold separately for total gear customization. This is the Real Deal The holster I have been looking for. THIS IS THE ONE YOU NEED. Best shoulder holster ever worn. The hoslter and design are excellent. Fit is the hard part. Only reason for the four star rating. I am skinny so still a bit hard to get holster adjusted so it will not show. 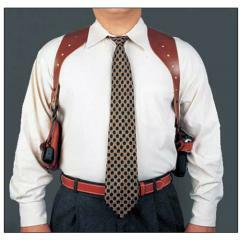 The shoulder holster is well made with very good materials. When it is adjusted it fits well and is comfortable for extended periods of wear. I bought it for my husband. He loves it. Nice color, fits comfortably. I hadn't worn a shoulder rig before, so I was very impressed how comfortable the DeSantis was. The workmanship and material used is excellent. Comfortable fit, but should have came with belt anchors. Yes - just select left handed before you select which gun fit you would like. Yes. Just select left handed when ordering. Is there a way to adjust it for us guys with a larger chest size? This harness will fit up to a 54" chest and pivots at all four junction points. Unfortunately this holster will not work with the P250C. Please check out the "Uncle Mikes Pro-Pak Nylon Horizontal Holster". ©2002-2019 CopsPlus.com: DeSantis 11D New York Undercover Shoulder Holster Rig FREE SHIPPING!